Fruitcake in cookie form! My picture is not the greatest, but this is actually a great holiday recipe. Preheat oven to 400 degrees F. Line baking sheet with parchment or grease. In a large bowl, cream together shortening and sugar; add egg, orange zest, and juice. Mix well. Sift together flour, baking powder, salt, cinnamon and nutmeg. Add to creamed ingredients. Stir in raisins, candied fruit and nuts. Divide dough in half. Shape each half into a strip roughly 7x12 (mine was more like 5x12) and bake for 12 minutes. Remove from oven; cool slightly, then frost with glaze while warm. Cut into strips. Glaze: Whisk together all ingredients until smooth. If you decide to brown the butter, your will need to add a little extra booze or a little water to get the right consistency. I did this in a saucepan. I doubled it. Not sure it was necessary, but I prefer having too much than too little glaze. Makes about 40, once you've eaten away the scraps. Cute story! I need to make them again soon. My mother started making these cookies for Christmas in 1955; I was 8 years old then. 60 years later, I still make these for Christmas. They are my favorite cookie of all time. Nice to see you here ;). Thanks for catching that. It is 1/4 cup orange juice. Anna, I’ve been a longtime fan of your blog, and am delurking for my first comment. These cookies rock! BTW, the recipe mentioned adding both the zest and juice. How much juice should we be adding? Am thinking of adding this to my Christmas bake list. I just love your awesome blog. 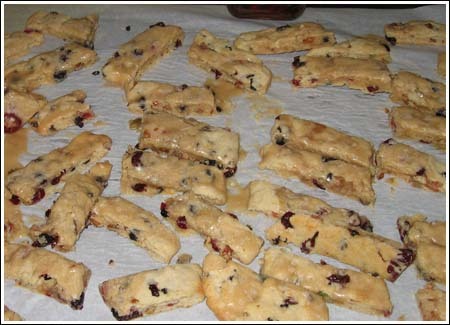 Here is a tip for those making spritz (cookie press) cookies for the holidays. Put your cookie sheets in the freezer for 15 minutes before pressing. Remember, most spritz cookies have a high butter content. The cold cookie sheet will grab the warm dough better than a room temperature baking sheet. These look really good..good enough that I may have to change my mind *again* about my cookie tray. I finally got around to the pecan pie chocolate chip cookies after turkey day. OH MY…so good. I had leftover chocolate bourbon pecan pie and used that and it was quite sinful. Therese, you rock too. I wish you were going to be at this party tonight. It would rock. Hey, you all ROCK. Cookies rock. It’s funny how everything rocks these days. A friend of mine is trying to replace the expression “rock” with Bueno!….as in you are BUENO! or that is BUENO! I hope it catches on. I’m glad you all like the recipe, because I ate too many of these (the trimmings, you know) and am walking around with a big trans-fat stomachache. Wait, I used trans-fat shortening, so it must just be fat stomachache. Oh well, party tonight means the day will end with stomachache so why not start early, right? The cookies had a great texture and held their shape well. I think the key is the egg yolks. You can change the extracts around if you don’t like almond — anything goes. YOU ROCK! Did you know that I am an avid Jack Daniels fan!! NO LIE! An ice cold beer and 1 shot of J.D. That is my flu shot!! You bet I will be trying this one out. Anna, I’m wondering if you have ever used a cookie press, and if so, what kind of cookie recipe you’ve used with them? I’ve had a cookie press for about 8 years that I recently dug out of a box and I’m dying to try it. Any tips would be appreciated!